The fourth installment in the long-running Terminator film franchise, Terminator Salvation picks up the story following a nuclear holocaust, caused by the Skynet automated defense system that played an important part in the original trilogy. John Connor (Christian Bale) has survived the blast, and is now struggling to bring together a rag-tag band of human survivors to battle against the immense, unstoppable machines that now control the world. The film was directed by Charlie’s Angels helmer McG, and co-stars Sam Worthington, Anton Yelchin and Bryce Dallas Howard. 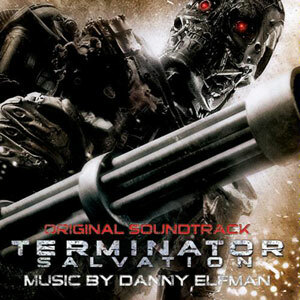 Joining the Terminator lexicon for the first time is composer Danny Elfman, replacing Marco Beltrami (who composed the third film’s score), who himself replaced Brad Fiedel, who composed the original movies’ iconic musical accompaniment. Unlike Fiedel, whose approach was all electronic, Elfman expands the palette considerably, with a full orchestra sitting comfortably alongside various synthetic and sampled effects, metallic percussion and rapid, mechanized tempos that recall his work on earlier scores such as Planet of the Apes. The main theme is a low, darkly heroic motif for brass, recognizing the troubled boldness of Connor himself; it appears in several cues as a marker for Connor, and provides with the score with a recurring – if a little understated – anchor. It’s soft, bittersweet recapitulation in the conclusive “Salvation” is especially nice. Action cues such as “The Harvester Returns”, “Hydrobot Attack” and “Final Confrontation” are brutal and complicated, with scintillating string runs and dominant brass triplets playing over the vicious percussive writing. In the Hydrobot cue especially, Elfman’s brass writing is exceptional, playing at the absolutely lowest reaches of their registers for extended periods of time. It is perhaps disappointing that there is no real recurring thematic construct for the terminator machines themselves, beyond the obvious textural choices of using plentiful metallic percussion, but these cues are very good for what they are, and then the main John Connor theme appears it gives the score a lift. The down-time (of which there is a surprising amount) tends to feature tender acoustic guitars prominently; “Fireside”, “Farewell” and others are really quite lovely, and clearly evoke the music of Gustavo Santaolalla, who McG originally wanted to score for film – and, no, this is NOT a joke. The other slightly disappointing aspect to the score is the complete lack of acknowledgment of Fiedel’s classic music for the original two films. Neither the main theme nor the five-note percussive stamp appear in Elfman’s score, which from my point of view is a somewhat unsatisfactory drift away from the franchise’s established and popular sound. Rooster (performed by Alice In Chains (6:16).